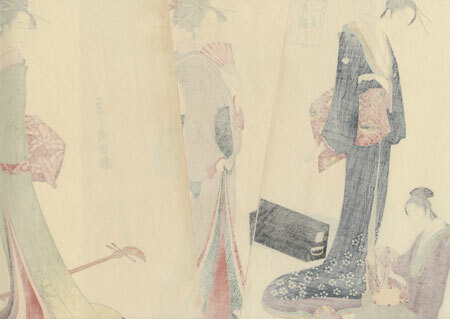 Comments - Lovely triptych depicting famous geisha of the Yoshiwara. 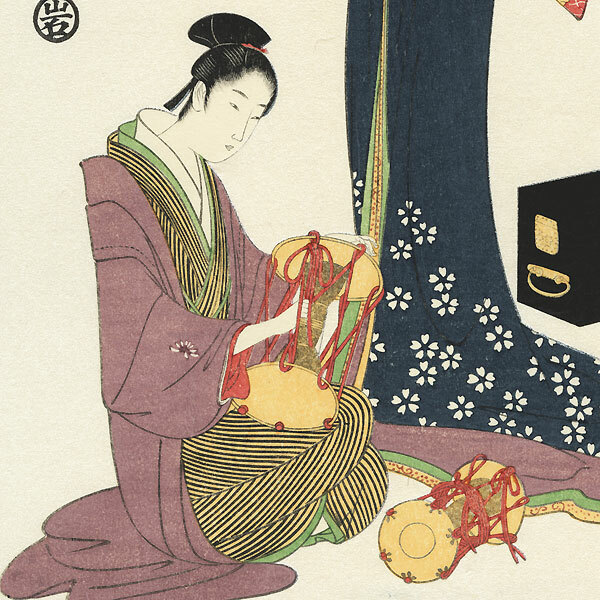 The left panel features Ohane and Ofuku, the seated woman adjusting the strings of a small hand drum in her lap, another instrument on the floor nearby. The standing beauty wears a soft gray kimono bordered with white cherry blossoms, tied with a red and yellow patterned obi. The black lacquer shamisen case on the floor behind features delicate embossing to indicate the edges of the box. The woman in the center holds a fan and wears an outer kimono delicately striped in purple and pink, a black lacquer shamisen case resting on the floor nearby. At right, the tall elegant courtesan Itsutomi holds a plectrum or pick for playing the shamisen, an instrument on the floor at her feet. Beautifully drawn with graceful flowing lines and a shimmering mica background. Condition - This print with excellent color and detail as shown. Paper remnants on reverse at top corners from previous mounting. Slight toning, a few creases at edges and small spots. Please see photos for details. Good overall.